Thread: Cool Fish... Prehistoric apparently! I don't understand what they're saying besides "preistorico" but that fish looks pretty much amazing. Check out those teeth! I've never seen anything like it. Wow, that is a pretty cool looking fish. Looks very prehistoric. Wonder how that would taste with a nice seasoning and baked with shallots, ginger and a bit of soy sauce and rice? Oh.. Actually that's a video of a rare frilled shark caught on film in January this year. Frilled sharks are relatively unknown becasue they live in extremely deep water. It's not really prehistoric (seeing that it was caught on film in January)... it's just a more primitive member of the shark family. You can find more information on it in english if you google "Frilled Shark"
Lol. I guess the guy who would know more about it would have fish in his callsign! A real prehistoric fish is the Coelacanth. It was thought extinct, but re-discovered a few years back. IMO they look pretty spiffy. I guess the guy who would know more about it would have fish in his callsign! Haha... no actually I just remember being really excited to see something like this when the news first came up. Well technically, nothing is truly prehistoric, theyre modern fishes too, just less derived. But yeah Coelacanths are real spiffy. Last edited by Spiralfish; August 4th, 2007 at 01:38 AM. At least the art is great! Well actually, a number of fossils have been found in the mid-Permian deposits in Russia, North America, Japan, and Australia. It's just that nobody really knows how it fits on the animal (and what it was for..), especially considering that the smallest teeth are the oldest. 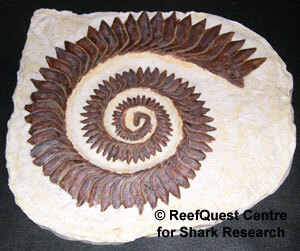 Almost nothing is know about this animal because the cartilaginous body did not preserve. Currently there's speculation that the body shape was not conventionally shark like and might have been more eel like. But no proof really, it doesnt help that the biology of ancient sharks is not exactly a lucrative cutting edge field. I got a fright when I switched over to the video to see the sharks gapping jaw. It's teeth are crazy, there are teeth on teeth. I don't know Spanish (It was some kind of Latin) but I love it how you see it swimming one minute then the next you see it dead. Truly that is a beautiful fossil. It really helps fire the imagination! Yea thank god they killed it so they could measure it... Bastards! He looked so happy too, swimming about minding his own bizz.